This article is about the marque spun off from Dodge in 2010. For historic Dodge trucks, see List of vehicles named Dodge Ram. North America, Middle East, Chile, Brazil, Colombia. Prior to the 1970s, Dodge had maintained a separate marque for trucks, Fargo Trucks, primarily for use outside the United States. After that point, all trucks made by Chrysler were distributed under the Dodge marque. Ram Trucks was established as a division of Chrysler in 2010, as a spin-off from Dodge, and using the name of the Dodge Ram line of pickups that is now sold under the Ram banner. According to Chrysler, the Ram Trucks brand will concentrate on "real truck customers," rather than casual truck buyers who buy trucks for image or style. The Ram brand was created following Chrysler's acquisition by Italian automaker Fiat, and the plans called for Dodge switching to an exclusively car-based lineup with all pickup and future heavy-duty trucks by Chrysler being sold under the Ram brand. This started in the 2009 calendar year. The Fiat Ducato cargo van design has been adopted and is sold as the Ram ProMaster in North American markets, filling the gap created when Daimler ended production of the Dodge Sprinter in 2008. The goal was to increase truck sales "from today's 280,000 to 415,000 by 2014". Executives at Chrysler have stated their intention to compete in the semi-trailer truck category with Ram, a possibility that is aided by Fiat's ownership of Iveco and an already available network of Dodge dealers. Even though the Ram trucks are marketed separately from Dodge cars, former Ram Division President Fred Diaz stated, "Ram trucks will always and forever be Dodges. Ram will always have the Dodge emblem inside and outside and they will be 'vinned' (Vehicle Identification Number) as a Dodge. We need to continue to market as Ram so Dodge can have a different brand identity: hip, cool, young, energetic. That will not fit the campaign for truck buyers. The two should have distinct themes." In April 2013, former CEO Fred Diaz left RAM to serve as vice president of Nissan's divisional sales and marketing. He was replaced by Reid Bigland. In August 2014, Ram truck brand CEO Reid Bigland was tapped to lead the Alfa Romeo brand in North America. It was announced that the new head of the Ram Trucks brand would be longtime Chrysler employee Robert Hegbloom, who joined Chrysler in 1986 and had previously been a director for the Dodge brand. The Ram brand logo features the head of a ram, formerly the logo used by Dodge. From 1927 to 1928, all trucks built by Dodge were actually sold under the Graham name, as that company held the marketing rights at that time. Ram 700 (2014–present): The Fiat Strada, a coupé utility sold in Chile, Bolivia, Colombia, and Peru, is sold as the Ram 700 in Mexico. Ram 1000 (2018–present): The Fiat Toro, a compact pickup manufactured in Brazil, is sold in Colombia as the Ram 1000. Ram 1200 (2016–present): The Fiat Fullback, a midsize pickup built by a Fiat–Mitsubishi joint venture, is sold as the Ram 1200 in the United Arab Emirates. Ram Pickup (1981–present): The flagship product line, it includes models 1500, 2500, 3500, 4500, and 5500. 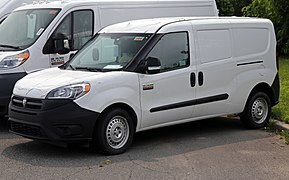 Ram ProMaster Van (2013–present): The line of Fiat Ducato full-size vans are sold as Ram ProMaster vans in North America. The line includes models 1500, 2500, and 3500, with cut-away cab chassis versions available. 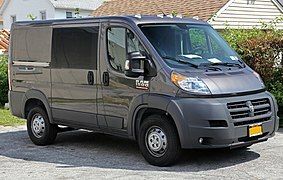 Ram ProMaster City (2014–present): The Fiat Doblò van is sold as the Ram ProMaster City in North America. Dodge Dakota (1987–2011). A midsize pickup, it was moved to the Ram marque with the full-size pickup lineup. Chrysler minivans (RT) (2012–2015). Cargo versions of the then-current Chrysler minivan platform were sold under the Ram marque until replaced by the ProMaster City. Ram vehicles are manufactured at three facilities, two in North America and one in Europe. Warren Truck Assembly, Warren, Michigan, United States. First opened in 1938, the facility has produced trucks for Dodge and Ram for over 70 years. Near the plant are also the Warren metal stamping plant, Mount Elliot tool and die plant which contribute parts and components to the manufacture of the Dakota and 1500 series. The following models are currently assembled at the plant: Ram 1500 series, all crew cab and double cab models for the global market are assembled here except for the Ram 1500 Laramie, which is built at both the Warren facility and Ram's Saltillo Assembly for the Mexican market. Saltillo Truck Assembly, Saltillo, Mexico. The plant manufactures the full range of the Ram truck series as well as the DX Chassis cab and ProMaster van. The plant has won numerous awards and has been recognized as the Chrysler groups best truck facility in terms of build quality. The Saltillo stamping plant is also attached to the facility. Ram 1500 all regular cab models of various trim levels sold globally are manufactured at the facility as is the crew cab Ram 1500 Laramie for the Mexican market. Ram 2500 all models of various trim levels, cab type, and bed length. Vehicles built here are sold globally. Ram 3500 all models of various trim levels, cab type, and bed length. Vehicles built here are sold globally. Ram 4500 all models of various trim levels, cab type, and bed length. Vehicles built here are sold globally. Ram 5500 all models of various trim levels, cab type, and bed length. Vehicles built here are sold globally. DX Chassis Cab manufactured for the Mexican and Canadian markets only. Tofaş, Bursa, Turkey. The plant produces vehicles primarily for the European market; however, the Ram ProMaster City is produced at Tofaş and imported into North America. Fiat Professional: Fiat Chrysler Automobiles light commercial vehicle brand marketed outside North America. Ram Trucks entered popular culture in an unintentional way on February 4, 2018 during Super Bowl LII. Their commercial's use of Rev. Dr. Martin Luther King Jr's sermon "The Drum Major Instinct" was quickly and widely panned by audiences, academics, news outlets and social media alike. Of particular concern was its insidious usage of a speech in which King condemned advertising ("we are so often taken by advertisers... those gentlemen of massive verbal persuasion"), to sell more Ram Trucks. Within hours content creators on YouTube had made spin-offs ("What Martin Luther King Actually Thought About Car Commercials", "The MLK Super Bowl Ad Dodge Didn't Show You", "What Dodge LEFT OUT Of Their MLK Commercial In Super Bowl" etc.) which showed a more accurate perspective of King's sermon and opinions about advertising. ^ "Ram brand created, Gilles to lead Dodge cars and Fong leaves in Chrysler shakeup". AutoWeek. 2009-10-05. Archived from the original on 2011-06-22. Retrieved 2011-01-23. ^ Hoffman, Bryce G. (2009-11-05). "Chrysler brands to aim appeal at specific lifestyles". The Detroit News. Retrieved 2009-11-07. ^ Kilcarr, Sean (2009-11-05). "Chrysler to get Fiat commercial vans". Fleet Owner. Archived from the original on 2011-03-01. Retrieved 2011-01-23. ^ McElroy, John (2009-11-06). "Chrysler Considers Getting Back Into Big Rigs". Autoline on Autoblog. Archived from the original on 2011-04-17. Retrieved 2011-01-23. ^ "Reid Bigland Gets Top Spot at Ram". pickuptrucks.com. 2013. Archived from the original on 2013-08-28. Retrieved 2014-06-22. ^ "Robert Hegbloom named head of Ram truck brand". trucktrend.com. 2014. Archived from the original on 2014-08-19. Retrieved 2014-08-18. ^ "Fiat Toro é apresentada como RAM 1000 na Colômbia". Motor1.com (in Portuguese). Retrieved 2018-11-14. ^ "Ram 1200". Ram Trucks Middle East. Retrieved 24 August 2017. ^ Dodge in Mexico: a history by Jaime Hale. "Chrysler, Jeep, and Dodge in Mexico". Allpar.com. Archived from the original on 2014-06-23. Retrieved 2014-06-22. ^ "People hate Dodge Ram's Super Bowl ad, which uses a Martin Luther King speech to sell trucks". nordic.businessinsider.com. Archived from the original on 2018-02-20. ^ "When U.S. Needs MLK's Voice More Than Ever, Automaker Dodge Waters Down His Message to Peddle Trucks". democracynow.org. Archived from the original on 2018-02-20. ^ "CNN on Twitter". twitter.com. Archived from the original on 2018-05-14. ^ "Ram Trucks Commercial With Martin Luther King Jr. Sermon Is Criticized". 5 February 2018. Archived from the original on 20 February 2018 – via NYTimes.com. ^ "Twitter Roasts Dodge Ram For Using MLK Speech to Hawk Trucks in Super Bowl Ad". www.mediaite.com. Archived from the original on 2018-02-20. ^ ""Drum Major Instinct" - The Martin Luther King, Jr., Research and Education Institute". kingencyclopedia.stanford.edu. Archived from the original on 2018-02-11. ^ nicholasflyer (24 April 2013). "Martin Luther King Jr., "The Drum Major Instinct" FINAL Sermon --- COMPLETE". Archived from the original on 14 February 2018 – via YouTube. Wikimedia Commons has media related to Ram trucks. Brown denotes models exclusive to Mexico. This page was last edited on 4 April 2019, at 05:56 (UTC).